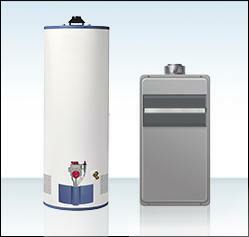 Gas or electric water heaters at an affordable cost – tankless heaters too! According to a 2011 Department of Energy report, the average family spends 17% of their energy expenses on water heating. That’s why you should schedule a tune-up with BFS at least once a year, to help ensure that your water heater is operating at its peak efficiency. And just think about all the daily tasks your hot water heater performs: cooking, washing dishes, laundering clothes, enjoying a soothing bath or shower, and so on. Those are more than enough reasons to schedule a repair with BFS when you have no hot water, equipment leakage, or other indicators of wear or impending problems. In either instance, your BFS technician will leave your home as clean as he found it, work as quietly and quickly as possible, and treat you and your water heater with the highest levels of professionalism. Should it be time for a new water heater, your BFS sales representative can help ensure that you have the correct system for your family’s size and energy usage, and then discuss what brands and products are best suited for your unique needs. We are always up-to-date on manufacture’s rebates, so if two brands are similar, we will advise you on which offers you additional savings to lower your investment costs. We can also compare your current annual energy costs and estimate how much money you will save in the future with your new highly efficient hot water heater system. So whether you need to buy a new gas or electric water heater – or tankless system – or have your current system serviced or repaired, contact us today to get a FREE estimate. Serving 18 locations across Florida, Texas, Arizona and Nevada.